A board certified orthopedic surgeon, J. Chris Coetzee earned his medical degree from the University of Pretoria School of Medicine in South Africa. He completed his orthopedic residency at the University of Stellenbosch, located in Cape Town, South Africa, his trauma fellowship in Davos, Switzerland and a foot and ankle fellowship at the University of Washington and the Harborview Medical Center, in Seattle, WA, USA. Dr. Coetzee sees patients at the TCO Eagan facility. He serves as a fellowship faculty member for the TCO/Fairview Foot & Ankle Fellowship program. He currently serves as President on the board for the American Orthopedic Foot & Ankle Society (AOFAS). He is an associate editor of the Foot and Ankle International Journal and also a member of the FAI Editorial Board, as well as reviewer to the Journal of Bone and Joint Surgery and several other orthopedic journals. He was the Chairman of the AOFAS Education committee from 2011 to 2013, overseeing all the educational activities of the American Orthopedic Foot and Ankle Society. In 2014, he was the chairman of the AOFAS Specialty day at the AAOS meeting as well as the annual summer meeting of the AOFAS. He is a member of the AAOS CME committee ensuring ongoing education for all orthopedic surgeons. He also served on the Instructional Course committee of the AAOS from 2014 – 2016. Dr. Coetzee is also one of the Official Team Physicians for the Minnesota Vikings and travels with the team. His special orthopedic interests are foot and ankle reconstruction, trauma injuries and sports medicine. He is a world-renowned surgeon who has been asked to lecture and teach in more than 20 countries on all continents. He is a published author in numerous peer-reviewed journals on such topics as total ankle arthroplasties, talar osteochondral defects, lisfranc injuries and more. Current research interests include total ankle arthroplasties, ankle fusions and subtalar fusions. Dr. Coetzee was named one of the top 23 Foot and Ankle surgeons in the US by Orthopedics Today in 2012 and 2013, has been nominated as a “Top Doctor” by the Mpls.St.Paul Magazine in 2013 and every year since (2014, 2015, 2016, 2017, 2018) and in 2016 was selected by Castle Connolly as Top Doctor. I broke my ankle on the playground in fourth grade. Little did I know trajectory at that time. I competed in gymnastics in high school. I learned how to play handball and golf. Some 40 years later, my ankle started to hurt. Eventually, I visited a noted sport medicine doctor and was told that the early injury brought about an early onset of arthritis. Nothing I could do; maybe wear a brace. Five years later, I visited other specialists, and they all told me I could have my ankle fused and I’ll know when. Another five years, and I was limping so much everyone asked if I hurt myself. I worried I was throwing everything in my body off kilter. I decided “it’s time” and made an appointment with Dr. Chris Coetzee to get my ankle evaluated for a fusion. After his review, he said I was a candidate for either. I looked at him confused and he explained he could either fuse my ankle or replace the joint. I asked and he explained that everything I had heard about ankle replacements not going well was old news. He said I would be able to run, play handball and golf as much as I liked. I turned to my wife and we decided to go for it. I never looked back! I used to walk around looking at the ground. We would go on trips and I could describe the sidewalks and streets but not the buildings or landscapes. I was terrified I would stumble and hurt myself. Now, I can walk anywhere without this fear. Forward, backward, up hills and down hills. My first ankle was more than 10 years ago and my second almost three. I won both the single and doubles Minnesota State Handball Championships in my age division this year. Everyone says I am moving better and better all the time. Dr. Coetzee and his team at TCO gave all of this back to me. If you are a candidate for an ankle joint replacement, you can’t do better than TCO. This summer, at the World Handball Championship held in Minneapolis, four of Dr. Coetzee’s patients gathered for a photo – there are seven replacement ankles on the four handball players (from left), Arnie W., Sheldon S., Scott S. and Larry L.
What can I say, Dr. Coetzee is a miracle worker. In 2005 I fell 35 feet and landed on my feet and broke everything. After about a year of surgeries I saw no results. I decided to get a second opinion and it was the best decision I could have made. It has been ten years and I walk fine and never feel any pain. Dr. Coetzee is compassionate and truly cares for his patients. I would recommend him to anybody. I thought Dr. Coetzee would enjoy seeing these pictures and hearing that Mary just completed her first Olympic distance triathlon. She loved it.We think of Dr. C often and will be forever grateful for him. Of course his skill is well known, but equally important is his complete lack of arrogance and ego, and his kind, caring, and patient nature. Such a rare combination. He is one in a million. So, please pass this along to him. I hope it brings a smile. Dr. Coetzee did a total ankle replacement for me 3 years ago. It has been life changing. Before surgery, I had so much pain it kept me from leading a normal life. Walking was a challenge as well as climbing stairs and just day to day activities. It has been 3 years since my surgery and I am pain free! I highly recommend Dr. Coetzee and his staff! I just wanted to make sure that I fully expressed my appreciation for all of the people at Twin Cities Orthopedics. They ALL went above and beyond my expectations in order to help me with my unique and untimely injury. And ALL truly means each and every one. From the very first interaction it was as if I had gone to another level of patient care that I had never experienced before. When I came by to drop off the imaging CD from my ER visit, the very personable and exceptionally nice woman at reception took extra time to upload the CD so that I could keep the disk for backup. She also took the time to hand carry it to the imaging department as her computer terminal was not confirming the upload. Lisa Long went the extra mile to fit me into Dr. Coetzee’s schedule so that he could perform the surgery before he went out of town. And then she went another extra mile to fit me in on a reschedule when insurance referral issues delayed the first surgery opportunity. Mary Wolf and Kristine Odegard both put in a herculean effort to get my insurance’s referral approved in two days, when it usually takes the system ten to fourteen. Larry Nilsson, Dr. Coetzee’s Physician Assistant with Jackie Fritz took out the stitches and advised me with care. And every interaction was personable, kind and not hurried or dismissive in any way. Each of these feats alone puts Twin Cities Orthopedics in the incredible category, but for them to all happen in coordination to attend to a patient’s urgent need is a health care synergy that is head and shoulders above any other medical interaction I have had in my 57 years – and my penchant for extreme sports has given me many interactions from which to claim my assessment to be authoritative. And of course, the personable and positive attitude of one of the very small handful of the very best foot and ankle doctors in the world – Dr. Coetzee – gave comfort and confidence that the best possible outcome for this unfortunate injury is in the cards. There just could not have been a better clinic to go to as Twin Cities Orthopedics and Dr. Coetzee are simply in a stand-alone, superlative category of patient care. In 2006 my left foot had totally collapsed. I had seen 4 podiatrists & 1 orthopedic foot specialist, all with different outcomes – a surgery recommendation that just did not sound right to me, a brace, and custom orthotics which didn’t help at all. Then my primary physician recommended Dr. Coetzee. I was able to get an appointment in 4 months (I lucked out!) and scheduled my foot reconstruction 2 months later. He was worth the wait! Then in 2014, my right foot needed plate and of course Dr. Coetzee was my doctor. I do a lot of dancing and I am back to doing it all – Latin, Ballroom, Swing – with no limitations whatsoever. Not only is he the best, but he is compassionate and he listens. Thank you Dr. Coetzee. Dr. Coetzee repaired my broken ankle in February. He and his team did a remarkable job! Once I was able to permanently remove the fashionable air cast, I progressed to physical therapy with Craig Ringsven. How fortunate for me to have both Dr. Coetzee and Craig on my team! Craig was phenomenal. While I understand “this is what they are trained to do”, Craig would modify a particular technique to adapt to my strength at the time, following surgery. His demeanor is kind; he gets along well with his co-workers. Anyone looking for an all-around wonderful Physical Therapist, ask to be scheduled with Craig Ringsven! You will be glad you did! Thank you, Twin Cities Orthopedics! I don’t know how to even begin to thank you for all you have done for my father and for my family. You are an amazing team that has made all the difference in my father’s future and his quality of life. It is Easter Sunday and I am watching him walk down the driveway like the father I haven’t seen in well over a year. Words cannot describe the happiness that I see as I watch him today. He has his independence back and he is getting stronger daily. He is an incredible man and I thank you for the additional moments and memories I get to have with him because of all of you. It has been a very long journey, and I cannot begin to tell you how much I appreciate all of your ongoing efforts throughout the process. From taking on his case so quickly, to the first visit, the surgery, the complications, the follow up visits and now the final outcome. You have all made such a difference and I don’t know how to truly thank you for what you have done. I can only tell you that you are truly special and you do something that is wonderful, you make a difference in people’s lives every day. Please know that while you do this daily, you are not the “norm” that we see all too often in healthcare these days. You are a very special team that combines an incredible skill set with professionalism, excellent care, and true compassion. That combination is very unique. Four years ago, in November 2010, I fell off a ladder and fractured both of my ankles. The emergency room doctor told me my ankles were severely broken or more specifically they were “bi-lateral pilon” fractures. The doctor described the fractured ankles as “impressive” (or doctorese as terrible breaks but repairable). The doctor further explained that a pilon fracture is where the break is caused by vertical pressure similar to stepping on a pop can from the top and causing the bones to be crushed. But, my original orthopedic surgeon “patched” me up with 4 plates and 30 screws and restored my ability to walk again. But the loss of the cartilage in my ankle joints caused me to hobble through life. In addition the loss of the range of motion in my ankle restricted the distances and the pace that I could travel. 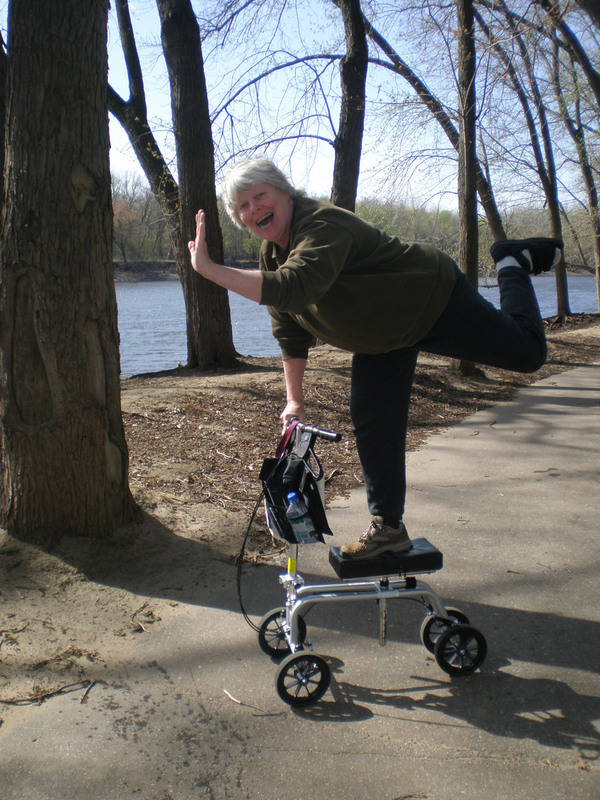 Prior to my accident, I was active with a keen sense of adventure. My wife and I love to travel and have a special love for the area north of Ely, MN known as the Boundary Waters Canoe Area Wilderness (BWCAW). Although following the accident, my mantra was “Staying home is not an option…”, but I now had physical limits to what I could achieve. As it turned out, the brother of a dear friend recently had ankle replacement surgery performed by Dr. Coetzee. She gave glowing reports of how his life had returned to normal following his surgery and how he resumed his passion for long distance bike rides. So, on July 5th, 2012, I hobbled into Twin Cities Orthopedics with my wife to meet with Dr. Coetzee. After what seemed like a “bazillion” questions, we agreed to schedule surgery to replace my right ankle in September 2012 followed by surgery to replace my left ankle in March 2013. Day by day, step by step, PT by PT my ability to walk returned and the hobble was replaced with a normal gait! …and best of all, I could now resume my sense of adventure and travel. Although I understood that I still needed to make wise decisions about which adventures to choose. To illustrate how far I have come, here is a photograph of me hiking the Path of the Gods trail (Sentiero Degli Dei) that is located on the Amalfi coast just east of Positano Italy with my wife and special friends. The section of the trail that we hiked was moderately rugged along a 4 mile path 1500 feet above the Bay of Salerno with sweeping views of the Amalfi coast. Jaw dropping beautiful! The island of Capri is visible 15 miles away. Experiencing this “bucket list” adventure was only possible with my new ankles. Every day and every step is a blessing and a miracle…so much to be thankful for! With the help of Chris Coetzee, MD and Brad Moser, MD, Marlys T. was able to climb the highest free standing mountain in the world, Mt. Kilimananjaro. She visited Twin Cities Orthopedics Edina for foot pain that was bothering her just weeks before the climb. Marlys explained that “after Dr. Moser gave me the ‘okay’ to climb, I only had ten days to prepare.” This involved training and shopping for gear. “Most people train for months” for such a climb, she said. “The extent of my training was a few times on the stair master and two six mile walks.” Marlys hiked the Machame trek, the second most difficult of six treks. “I did not have any pain in my body until the very last day after I descended when my knees ached slightly,” she said.